Oceanside is a coastal city located on California’s South Coast. It is the third-largest city in San Diego County, California. Together with Carlsbad and Vista, it forms a tri-city area. Visitors to Oceanside can enjoy a quintessential California coastal escape that includes wide sandy beaches, a quaint New England-style harbor, historic wooden pier, and charming bungalow neighborhoods. O’side (as locals affectionately call it) is a destination of discovery where visitors can explore everything from California history at the “King of Missions” to surf culture at the California Surf Museum, and awe-inspiring sea life through exciting ocean adventures. Perfectly situated between metropolitan San Diego and Los Angeles, Oceanside is centrally located in the heart of Southern California, in close proximity to the family-favorite attractions including LEGOLAND California Resort, SeaWorld San Diego, Disneyland California Resort, and the world-famous San Diego Zoo. 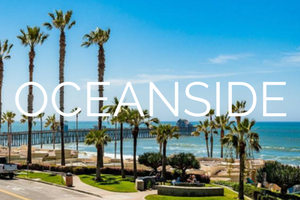 With its year round sunny climate, and average temperature of 70 degrees, Oceanside’s weather has been rated by USA Today as the second most ideal climate in the United States, and the fifth most ideal weather in the world.